A few hours ago, you officially became part of a uniquely creative, innovative, and civically engaged community. Welcome to The New School. As a new student at one of the nation’s most unique universities, you will play a critical role in expanding the frontiers of thought and contributing to The New School’s dynamic urban community. As you get settled, keep a lookout for the New School News—a go-to online news source. The News offers a glimpse of New School life that’s anything but ordinary. This comprehensive blog brings you stories about students, faculty, and upcoming special events. Every other week, we’ll send an email with links to feature stories that look in depth at the names behind the New School headlines. And become a fan of the New School Facebook page to keep up to date on our more frequent news blog postings. The August 27 back-to-school issue will provide an inside look at the University Center, The New School’s state-of-the-art new building on the corner of 14th Street and Fifth Avenue; an exploration of Masterpieces of Everyday New York: Objects as Story, currently on display at the Sheila C. Johnson Design Center; and a photographic journal of what New Schoolers were up to over the summer. The New School News is one of many ways to stay connected. Be sure to also check out MyNewSchool, the portal to academic and student services, campus announcements, and a variety of events taking place around New York. If you’re feeling social, find out what’s going on by logging on to the Connect Portal or by following The New School on Twitter, Facebook, Instagram and other social media. Have feedback, suggestions, or story ideas? The News would like to hear from you. 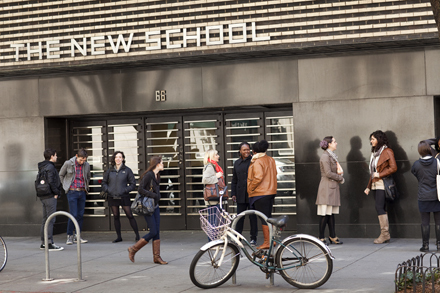 Contact us at news@newschool.edu. Finally, use the hashtag #NewSchoolSpirit to share comments and photos on social media and show off your school spirit!